Milano Malpensa Airport "City of Milan" is the largest airport of Milan, northern Italy. The first industrial airport was opened in 1909. The civil flight airport was then opened in 1948, during war reconstruction, to serve the northern area of Milan. Until recently, it was a major hub for Alitalia, but now serves as a hub for long-haul flights and low cost carriers. 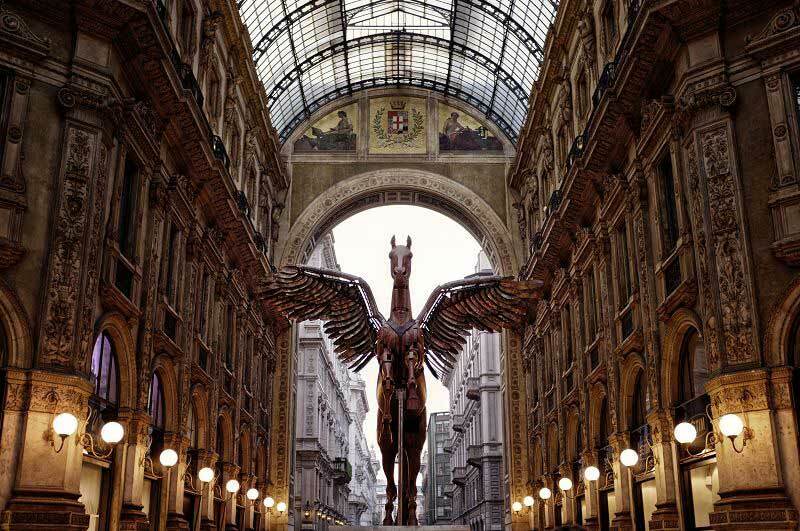 Milan is the main industrial, commercial and financial center of Italy and a leading global city. The city is a major world fashion and design capital. Thanks to its important museums, theatres and landmarks (including the Milan Cathedral, the fourth largest cathedral in the world and Santa Maria delle Grazie, decorated with Leonardo da Vinci's "The Last Supper", an UNESCO World Heritage Site) Milan attracts more than 4 million annual visitors. Lake Maggiore can be reached at just around 30 km distance. Different sights and touristic locations can be found in the surrounding areas to Malpensa Airport: Stresa and Isola Bella; Isola di San Giulio; Museo sul Sempione, property of a private antique collector where antique airplanes, tank engines, motorbikes and much more can be found. Castello d'Angera where the Doll Museum is located. A variety of woods and mountains where long walks and mushroom or chestnuk picking can be part of a relaxing day in contact with nature. Mount Mottarone, at a few kilometers from Stresa, where skiing and other activities are available. The archeological sites of Sesto Calende and Golasecca. Sacro monte, in Varese. *Additional fees may apply. Please select the options you want to integrate in your booking throughout the next steps of your reservation. You can find a detailed explanation of our service in our Rental Information section. The Sixt branch is located under the arrival hall, please follow the signs for "Autonoleggi/Car Hire". You can reach the airport via train from Milan with the Malpensa Express or, in alternative, the train S30. Coming via freeway A8 from Milan, take the exit for Busto Arsizio-Malpensa in the direction of Gallarate-Malpensa. If you travelling on the A4, coming from north, take the exit Marcallo Mesero and follow the directions for Marcallo-Mesero-Malpensa, then go on the SS336 towards Malpensa-A8-Milano-Varese. Please return your Sixt vehicle at parking P2, get a ticket to enter and follow the Sixt signs. Please return your Sixt vehicle at parking P2, get a ticket to enter and follow the Sixt signs. When you arrive at the Sixt Check-in cabin drop the key into the orange key box integrated.